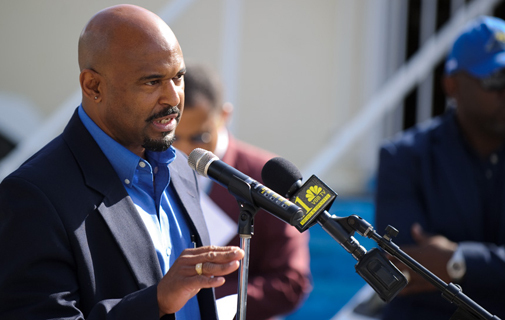 FRIDAY, FEBRUARY 1: The abolition of term limits could cut job opportunities for Bermudians, a union chief warned yesterday. “It it’s not handled correctly, this could cost Bermudians jobs,” says Kevin Grant, president of the white-collar Bermuda Public Services Union. His take contrasts sharply with reaction from the business community, which has -warmly embraced the change and cited it as a stimulant for the economy and job creation. Mr Grant pointed out that term limit abolition would not just apply to CEOs of international business, but down the line to semi-skilled roles like landscape gardeners. Mr Grant called for future policy proposals to be discussed by a tripartite group representing labour, business and Government – and for strong trades union representation on the Immigration Board. Mr Grant was speaking after OBA Home Affairs Minister Michael Fahy announced an end to the current six-year limit on overseas workers. Mr Grant said: “The Minister said he had spoken with some pertinent stakeholders on this – but he has had no dialogue with us on this. The OBA Government may feel this is in the best interests of the country and we know some jobs may require contract workers. We would be blind if we didn’t see that. There appears to be strong disagreement on the consultation issue. Mr Grant said that while the Bermuda Trades Union Council (BTUC) had had two representatives on the term limits working group, it had not been clear when they had to respond to requests for comment on either suspending term limits for two years or getting rid of them altogether. Mr Grant declined to speculate on what the precise effects of the change in policy might be. He said: “I can’t presuppose – I would like to see whether this would have an impact. The world economy has caused international business to relocate wherever they want to. “The ramifications that this may have on the community and Bermudians being able to be gainfully employed have not been seen yet. Bermuda Industrial Union leader Chris Furbert earlier this month took a swing at Government for axing BIU representation on the Immigration Board – although some labour representatives continue to sit on it. Mr Furbert could not be contracted for comment yesterday. Bermuda College economics lecturer Craig Simmons said that term limits were introduced to avoid the issue of long-term residents expecting the right to live permanently in Bermuda, while work permits were aimed at protecting job opportunities for Bermudians – and that policy had not changed. He added that it was important that people from overseas did not have the expectation that they could qualify for resident status if they remained in Bermuda long enough. Mr Fahy said on Wednesday that talks with key people had been an “integral component” of the decision to end term limits. And he added: “I want to remind all Bermudians that every work permit holder is in Bermuda for a defined period based on the length of their work permit. When a one, two or three year work permit expires, the job must be advertised. And he pledged that the OBA would boost training and development to prepare Bermudians for the job market, as well as introducing tougher sanctions against employers who breach work permit policies. The move was welcomed by the Bermuda Employers’ Council, which said the change removed “a stumbling block” for international business. Roban: What happened to term limits review?